How do I approve drivers to drive certain vehicles? In some cases, you'll only want to allow certain drivers access to certain vehicles in your fleet. In order to accomplish this you'll need to either upload a Fleet Vehicle or modify a Fleet Vehicle already exists in the system. 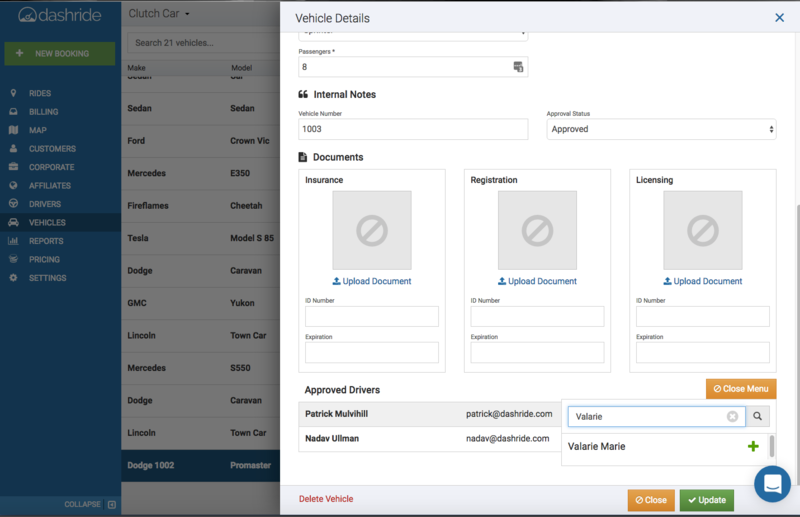 Once there, simply go into the Fleet Vehicle, scroll down, and click "Add Driver" to approve specific drivers (or just one driver) for that particular vehicle. See Below! It's worth mentioning that it is very important for you to review all vehicles that drivers may add because you want them to match the Vehicle Types & Requirements. If they don't match, your drivers will not get sent rides! Please Note: When you allow drivers to add vehicles from within the driver app, they cannot be shared with other drivers!